The Latin name for these beautiful fish from New Guinea and northern Australia is Iriatherina werneri. These nervous and sensitive fish thrive in slow moving streams with heavy vegetation. According to the Master Index of Freshwater Fishes, they enjoy a pH of 6.0 – 8.0, with a designated hardness from 5 -12 and a water temperature of 79 – 86 degrees Fahrenheit. I keep two males and 4 females in a 10 gallon tank, with a corner filter containing charcoal and ammonia chips and one or two artificial yarn spawning mops. They prefer a dark green mop that hangs from a cork or 35mm film canister to almost an inch from the bottom of the tank. I keep no gravel or plants in the tank, only the mop. I have tried either light blue or black yarn mops with little success. With the dark green mop I have been averaging 40 eggs per week. They prefer to lay their eggs between the middle of the mop to the bottom. I pluck the eggs from the mop on a weekly basis moving them to a plastic shoebox where I allow the eggs to hatch with a slight amount of Acriflavine to prevent fungus. In a few days you can see the tiny babies swimming across the top of the plastic box. I then move the fry to a larger plastic box to grow out. These are slow growing fish that need rotifers, artemia or Small Fry Food. After a few weeks, with 3 times a week water changes (only with aged water), they are large enough to take baby brine shrimp. Water changes are extremely important for this fish to maintain good health. I change the water in a 35 gallon tank next to the Threadfin rainbow fish tank. After the freshwater has been filled in the larger tank, I wait several hours or the next day to take water from that tank to replace water removed during a water change. Using this mixture of new and aged water, there is no stress on the parents or fry. I feed the adults live or frozen brine shrimp and cyclopeeze, because their mouths are small, twice daily and perform weekly water changes of 20%, as outlined above, in the adults’ aquarium. Threadfin rainbows are one of the most beautiful freshwater fish I have ever seen. 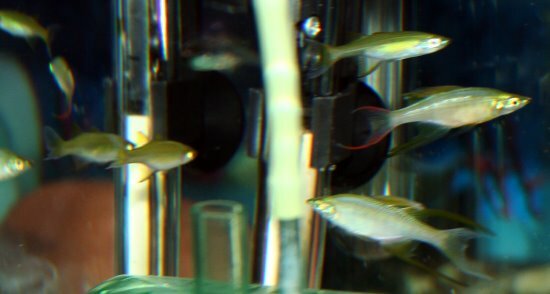 The females are a silvery color, but the males have long flowing fins of black, red and yellow. The males use a flickering of their fins to attract the females to spawn. If you want to keep an interestingly beautiful fish that will give you hours of enjoyment, then I highly recommend these graceful beauties. Previous PostWhiptail CatfishNext PostDonate Food or Toys, Get Tix to New York Aquarium! Threadfin Rainbow…Beautiful fish Joe! I would love to get my hands on a few.